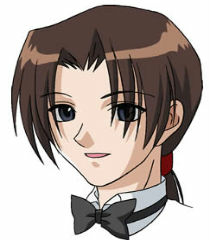 Keiichiro Akasaka is Ryou's assistant in the Mew Project and the head chef at Café Mew Mew. Adopted by Ryou's parents at a young age, he worked as an assistant to his father and later to Ryou himself. He helped oversee the Mew Project and is the one who kept tabs on the Aliens and looked out for Mew Aqua. Keiichiro is 21 years old (as young as 17 in some dubs) and is also the brilliant scientist who created Masha. He is a very kind and caring individual, often serving as a big brother figure for some of the Mews. He is able to stay calm at the most stressful times and is also highly intelligent. He is shown to be quite the gentleman and often impresses many characters (mostly females) with his impeccable etiquette and good taste. Keiichiro has light skin and long dark brown hair which he usually keeps tied back in a ponytail. He has dark grey-blue eyes. Most of the time, he wears his Café Mew Mew uniform of black pants, white collared shirt, suspenders, and a bow-tie. Keiichiro is still Ryo's assistant and one of the pioneers of the Mew Project. He is in a relationship with Xin Tsun and is one of the only people who tries to actually keep a friendly relationship with Dr Ly despite it obviously not being a good idea. Keiichiro still works at the café. He is the head chef and helps the girls take care of orders and also assist Ryou, as per usual. At the start of Mythical Mew Mew, Keiichiro is 31 years old. He's the only one working at Café Mew Mew besides the new scientist Yuuna Hasogai, a worker at the café whom was an apprentice worker before she became a scientist and was given the duty of the new group of exchange student Mew Mews. He's still working the same position he was before.